These days, whenever the tenuous future of classical music is discussed, inevitably you hear a discussion of the importance of performing in unusual or less traditional venues; of performing contemporary classical music and new works; of fusing classical music with other music and forms of art; and of reaching new audiences. In Madison, the group NEW MUSE aims to do all of that and more. This Friday night the group will perform at the Madison Museum of Contemporary Art (MMOCA) in the Overture Center. What are the specifics about the “concert” this Friday night? This event will take place on Friday, Feb 11, from 6:30 p.m. to 9 p.m. in the Madison Museum of Contemporary Art, as part of their February MMoCA Night. The music and reception will begin in the beautiful glass foyer known as the “Icon” (below), and proceed up to the 2/F main gallery at 7 p.m., when members of the UW First Wave Spoken Word and Hip Hop Arts Learning Community will perform among the installation art of artist Shinique Smith. Music will continue afterwards in the gallery until just after 8 p.m. — performers will be “installed” among Smith’s visual art pieces — and then in lobby until 9 p.m. 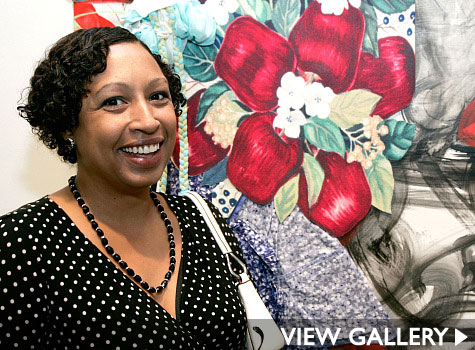 This event is free for MMoCA members, $5 (at the door) for the general public. 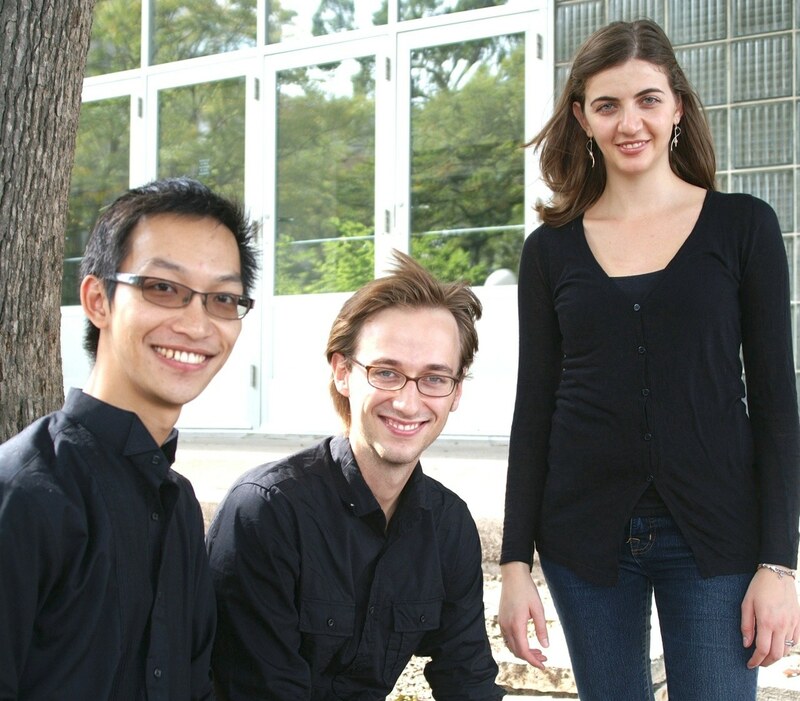 NEW MUSE is an ensemble of Madison-area musicians composed of top University of Wisconsin School of Music students and area professionals who are dedicated to performing contemporary music. Our program for Feb. 11 will complement the art of Shinique Smith (below), whose work freely combines influences from Western academics, Eastern calligraphy, pop-art and the street. Likewise, NEW MUSE’s selection includes works whose style defies boundaries. Our ensemble includes: Jerry Hui, conductor/baritone; Jonathan Kuuskoski and Paola Savvidou, pianists; soprano Jennifer Lien; Dawn Lawler, flute; Rosemary Brumbelow, clarinet; Clayton Tillotson, violin; Andrea Kleesattel, cello; and Tim Patterson, percussion. This Friday our special guests include: Jennifer Sams, mezzo-soprano; Beth Larson, violin; Chia-Chien Goh, violin; Kerry Smith, viola; Ben Willis, string bass; Theresa Koenig, bassoon; Brian Ellingboe, bassoon; and Sean Kleve, percussion. What is the program for Friday’s performance? Some of the highlights include Nicholas Roussakis’ “Night Speech”, where a speaking chorus utters sounds over sparse percussion, evoking a Zen-like picture of the night hours. Gabriel Prokofiev’s String Quartet, No. 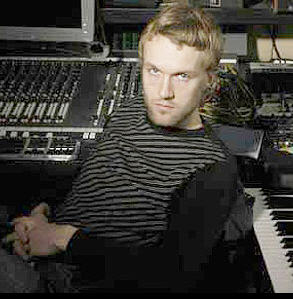 1 (Gabriel, below, is a London-based composer, DJ, and the grandson of famed composer Sergei Prokofiev) takes the sound of a familiar classical ensemble and mixes it with the rhythm and energy of pop and hip-hop music. Madison-based composer Jerry Hui’s “White Tiger: Evil Star” draws on the mystery and menace behind the Cantonese tradition of “Banishing the Little People,” a folk witchcraft performed at the beginning of spring to curse away one’s enemies. 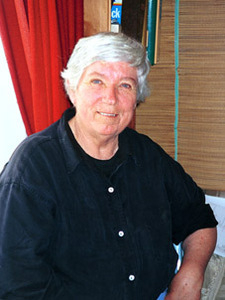 The selected “Tone Clock Pieces” for solo piano, by New Zealand composer Jenny McLeod (below), are a post-Messiaen mosaic of colors and unpredictably driving rhythms. This will be the work’s Wisconsin premiere. The rest of our program includes an eclectic mix of styles and instrumentation, from Yiannis Constantinides elegantly forlorn “Five Songs of Love” (for mezzo-soprano and piano), to Tom Johnson’s humorous yet virtuosic “Failing: A Very Difficult Piece for String Bass,” featuring special guest Ben Willis (of The Weather Duo). Lutoslawski’s “Subito” (for violin and piano) and Freddy Mercury’s “Bohemian Rhapsody” (arranged for bassoon quartet) will cap the evening. Why was NEW MUSE founded? Contemporary music has largely become disconnected and irrelevant to the public. As Madison’s first professional contemporary music ensemble, we seek to rebuild this connection, to change the generally held assumption that classical music of the 20th and 21st centuries is unapproachable. To do so, we organize events in creative collaboration with other arts organizations; combining visual art, dance, storytelling and all other forms to bring vibrant, engaging, and fun musical experiences to new audiences. What do you plan to do at upcoming events? “The Story of Babar, the Little Elephant” will take place on Tuesday, March 29, at 2 p.m., at the Madison Children’s Museum. 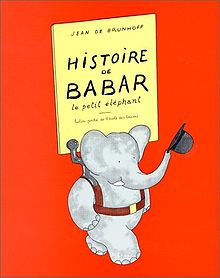 We’ll be performing “The Story of Babar” for piano by Francois Poulenc, who composed it for his daughter when she asked him to play something from Jean de Brunhoff’s cartoon storybook “Histoire de Babar” (below). In this event, we are adding another layer of interaction by collaborating directly with the audience, who will be invited to act out the “story” of the music during the performance, or to write down a story, picture, or use the space to move as the music compels them. In other words, we will offer a chance to re-connect music with the other creative processes that give wonder to the experiences of childhood. We are also planning a one-of-a-kind cabaret night at Plan B, a local night club, where we will bring together cabaret, contemporary chamber music, DJ, dance and live poetry to create an entertaining and unforgettable musical evening. That date will be announced in late April or early May. Future plans include a street music festival and a concert series highlighting little-known Madison landmarks. If we can keep things local, connecting our various arts communities towards a common goal, we believe our programs will continue to grow and diversify. How did NEW MUSE get started? New Music Everywhere (abbreviated as NEW MUSE) began as a dream among four graduate students in music at the UW-Madison: Paola Savvidou and Jonathan Kuuskoski (both pianists), Ching-Chun Lai (conductor) and Jerry Hui (composer/conductor/performer). We are all advocates of new music, and though our individual career paths have been diverse, we converge on the idea that artists can and should do something for society through their art-making. As socially driven entrepreneurs, we all realized that the Madison music scene could benefit from a professional ensemble focused on contemporary music. And while there are many opportunities to hear music in traditional venues here, we don’t always recognize the power of music to enrich our lives when it occurs in everyday places. In August, Ching had to leave Madison for a job opportunity on the East Coast, but Jerry, Paola and I (below, Jerry on right)) decided to plow ahead. After much brainstorming, we settled on the concept of prioritizing music-making in non-conventional venues, and to construct each program for the specific location, time and space of the venue. Around the same time, were very fortunate to be selected as one of five projects to receive the nationally competitive Yamaha In-Service Fellowship from College Music Society, a starter grant for socially conscious arts ventures. Have you done other projects or performances? We launched with a surprise flash-mob on 9/11/2010 to commemorate the victims of the 9/11 attacks at the Dane County Farmers Market. A 60-singer chorus, string orchestra, and dance trio performed Samuel Barber‘s “Adagio for Strings” spontaneously among the crowd at exactly 8:45 a.m. when the Twin Towers were first struck. It was a success, reaching hundreds of community members and garnering local media coverage with WKOW-ABC 27 and Madison.com. Long story short, we were off and running! In December 2010 we were awarded another project grant from the Dane County Cultural Arts Commission to fund our inaugural season. Why are projects like this important in reaching new audiences? These events are exciting opportunities to directly engage a diverse community in spaces that don’t normally see contemporary music combined with visual art, dance, and the spoken word. For us, the audience should always be considered part of a community of participants; our events will combine dancing, musical installations, and storytelling in such a way that these participants can move, react, and respond within each musical experience. This idea has the potential for changing the way people view classical music, making it refreshing and fun for all ages. NEW MUSE is but one example of a larger movement sweeping across the nation, where aspiring artists are tapping into the entrepreneurial spirit to find innovative means towards enriching their communities. These sorts of ventures often start small, and must be unique to each locale, but we firmly believe that our adventures are planting the seeds for the future of our field. The precarious situation that all the arts face today can and must be addressed by those who practice that art; in other words, we are challenged with the task of renegotiating the contract with our audiences (to borrow from Andrew Taylor’s wise words). Live art comes at a premium, and artists are now more than ever considering what they have to offer. Is it good enough? Do people want art in their lives, and in what form? How could it be better? By creating fresh perspectives on what a live musical experience can be, and by building connections with other local arts organizations, we intend to reinvigorate the experience of live music performances (even the contemporary classical variety) and to broaden the circle of participation – ultimately to evidence the special power of art, and its potential to add value to the lives of people everywhere.